Baedeker editions on the Rhine in French. See also editions in German and English. 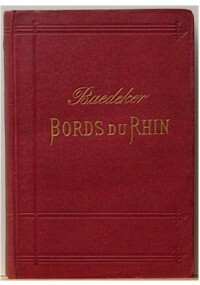 Like in the other languages, the Rhine country, Baedeker's homeland, was the first to be given a guidebook in French. However, the first edition on the Rhine is special, because it was the first travel guide originally published by Karl Baedeker - a translation of the older Rheinreise, first published by R�hling.